Water softeners make your life easier. However, maintaining an efficient Chicago water softening system takes some thought and planning. 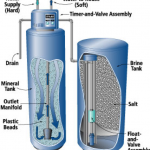 When maintaining and taking care of a water softener system, the following are a few key tips to keep in mind. The three most popular types of salt to choose from are rock, solar and evaporated. Rock salt is mined underground. It is the most economical form of salt, but contains high amounts of calcium sulfate which doesn’t always dissolve completely in water and can sometimes cause maintenance issues. Solar salt is created from evaporated sea water. It is very soluble but doesn’t always work the best when water hardness levels are extremely high. Evaporated salt has the highest purity rate, but can be the most expensive. It creates the least of amount of maintenance problems compared to the other two salt options. We recommend checking your brine tank monthly. The more often you check on it, the better your chances are of not having maintenance problems and salt build up. It is a good idea to set a reminder in your calendar and make this a part of your monthly routine. Salt bridges and “mush” build up are the top two most common issues when maintenance problems arise. Keeping your tank clean is the number one way to avoid these problems and save you money by preventing any serious malfunctions. Salt bridges are when the water and salt separates from one another and creates a salt layer on the top of your tank. This can happen if there is high humidity, temperature changes, or using the wrong kind of salt. It is easily detected if your tank appears to be full but your water isn’t soft. The best way to fix this problem is to take a pole and poke at it to break up the salt and have it dissolve back in the water. Mushing happens when there appears to be a mush build up at the bottom of your tank. You can fix this by draining your tank. If it continues to happen, we recommend switching the salt that you use. If all of this seems a little daunting or overwhelming you can always call the family-owned experts at Johnson Water Conditioning. We are the water conditioning company that Chicagoland has trusted for decades. It is important to maintain your water conditioning system. It is very easy but it just as easily be forgotten. In order to ensure a smooth-running system for years to come, make sure you are checking on your system at least once a month. The water quality experts at Johnson Water Conditioning are always happy to answer any questions and help identify solutions when it comes to your system. Our soft water conditioning service is designed to ensure your home and family have the highest quality water available.